It was hot when we were in Japan in May. To be out sightseeing and climbing up hills to temples and shrines wasn’t easy no matter how many iced soy matcha lattes with cat and moustache cup options there were there when you got back down. Why is the soy milk so creamy there? Why was matcha not making me gag? (clue: I don’t know. Japan is magic.) I still went and saw whatever I wanted to see and laid low writing postcards in my neighbourhood cute coffee shop in the afternoon when it was peak-vacation naptime in Kyoto. When I was visiting with my pal Kei, she drove us around in her pink Toyota making us less heat exhausted but still heat exhausted nonetheless. I could deal with it. My husband mumbled “jet lag” and we were more than happy to drop him back to our hotel room so we could go into the countryside to pet cows. But before we did that, she took us to the soba-ya so we could eat soba(!!! ), a buckwheat noodle. I didn’t think I was eating the best soba living in America. I always said I loved udon more but hello, who knew that when you make soba on the daily and feed it to tourists you could get them to change their minds about their favourites? Not this person. Cold noodles are an enigma to me. I didn’t know you could eat them that way and enjoy them. In my parents’ house, cold food for lunch is blasphemous. A degree over piping hot, the food was too cold. It all had to be “micro-d” back up, my father would say. On my own, I have come to relish the comfort of a cold beverage or a crunchy salad on a warm day. In fact, I crave it. Noodles hadn’t made that list until now. Sharing zaru (cold) soba for lunch that day was a revelation. Maybe it was the company or maybe it was just the meal for that weather but I knew had to make it a summer staple. The bite was perfect and the dipping sauce took it to another level. I admire Japanese cuisine for being able to create complex flavour our of simple ingredients. It’s a subtle art, one that comes from years of practice. My recipe is simply born out of a craving. Since the food memory is still fresh in my mind, I wanted to recreate it and share it with you. It’s a wonderful dish to share. Most of the work is done in the prep stage and you have to spend barely any time in the kitchen. As for the ingredients, fresh noodle are #1, frozen are #2 and dry noodle packs are #3. 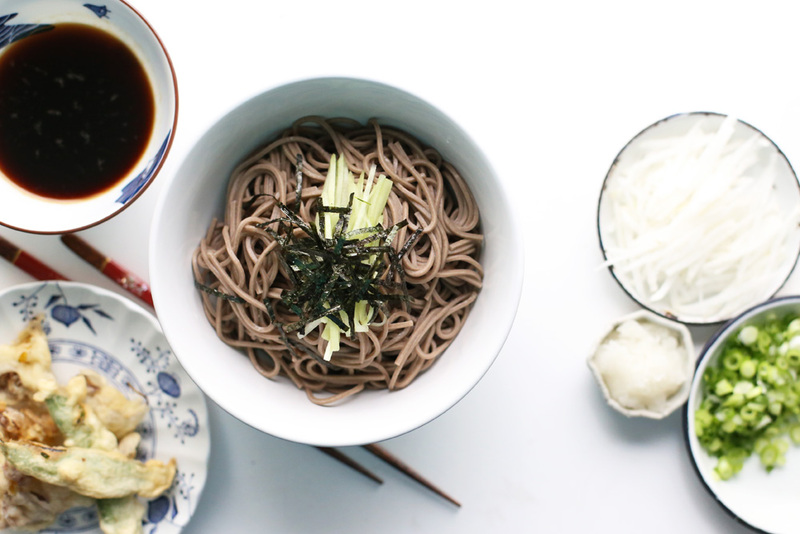 It’s better to have soba than no soba at all so using dry noodles isn’t a sell-out. 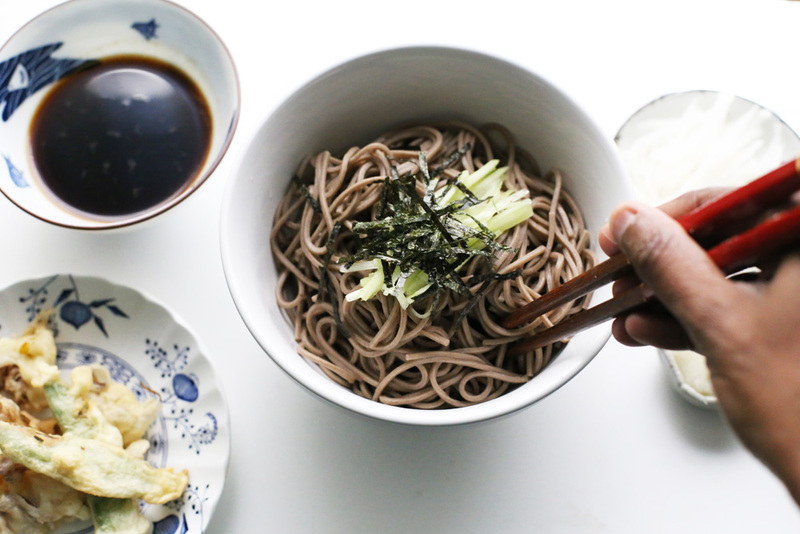 Mentsuyu is the soup base that you will dip the soba in. It’s made with mirin (sweet wine), sake, soy sauce, kombu (dried kelp) and katsuobushi (dried bonito flakes). If you’re vegetarian, it’s okay to substitute katsuoboshi with dried shiitake mushrooms in equal proportion (I did it this way because I’m Edlyn and I love mushrooms and didn’t want to go over my grocery budget). You can buy most of these ingredients at Japanese or Asian grocery stores in the US, including the soba sauce. That’s right! If you don’t want to make mentsuyu at home, you can buy it off the shelf and dilute it with water if it’s in a concentrated form. Okay that’s enough yapping. Here’s the recipe! To see more Japan, there’s this blog post and my instagrams. Soak all the ingredients in a covered pot for 3-4 hours or overnight. Bring it to a simmer on medium heat and let it stay at a simmer for 10-15 minutes. Don’t let it boil. Strain the liquid into a bowl using a fine mesh strainer and discard what is left behind. Pour the mentsuyu into a jar and store in the fridge for up to two weeks. 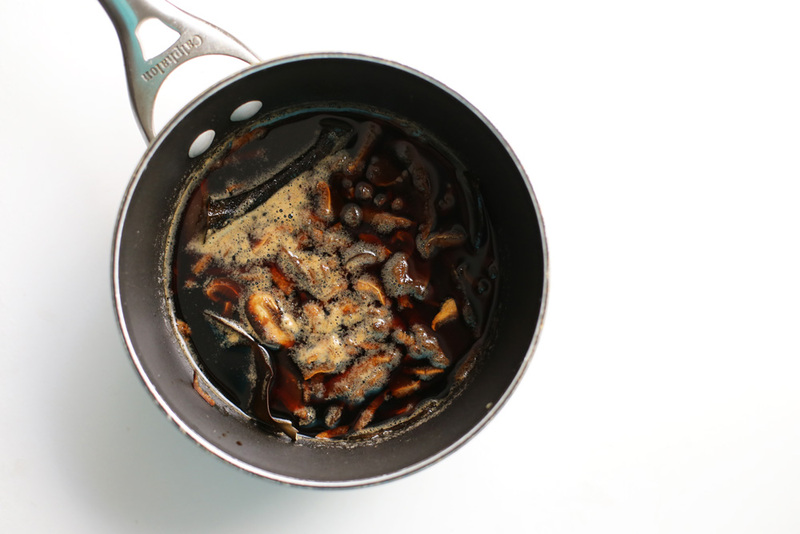 up Alternatively, you could reuse the soaked kombu and shiitake to make another soup base by adding water. If you’re using dried soba from a package like I did, the back of the package might have instructions on how to cook it. If not, cook as follows. Have a basket-like strainer set over your sink. Bring 6 cups of water to a boil in a large pot. Add the soba to the boiling water and stir to spread the noodles out. The water will start coming to a rapid boil (almost bubbling over). Reduce the heat to a quick simmer at this point and cook for 6-7 minutes. Once the noodles are al dente (it should have some resistance when you bite into it), take the pot of the heat and strain it in the sink with cold water running over the noodles. Rinse and drain the noodles and serve them into bowls. 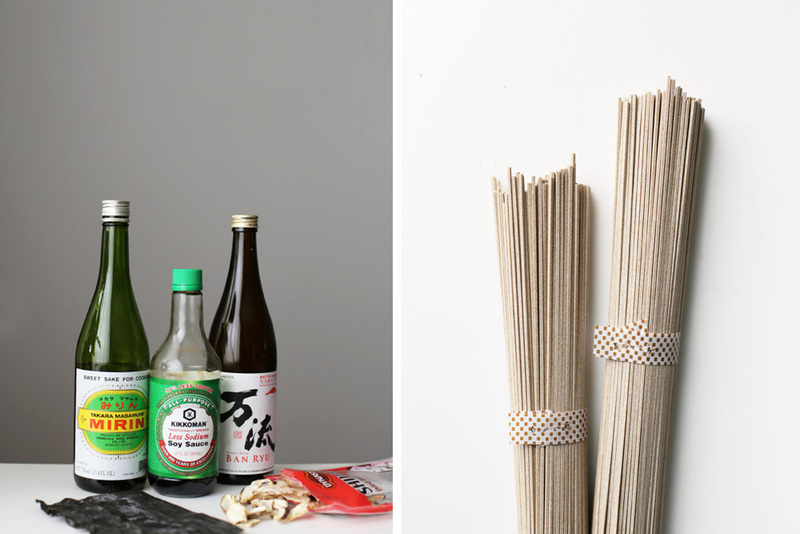 You can pour the mentsuyu on top of the noodles or serve separately into a bowl for dipping. 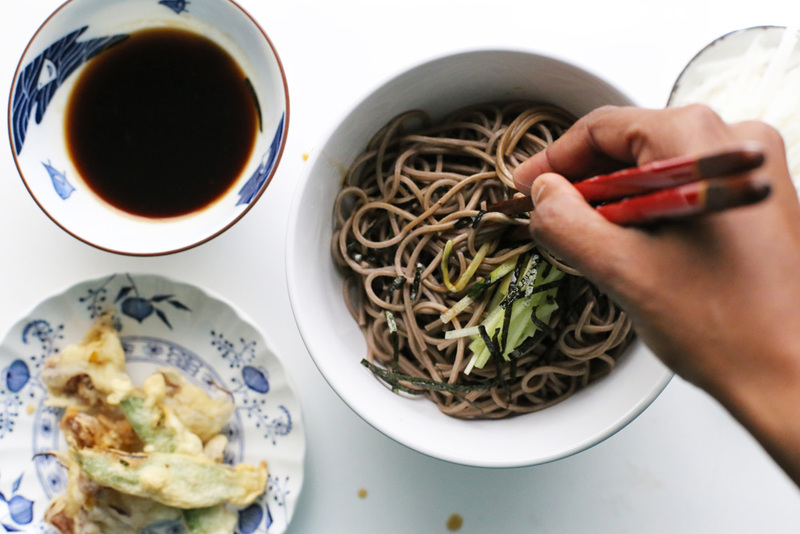 Top the noodles with kizami nori and serve the green onions, radish, cucumber and wasabi on the side. 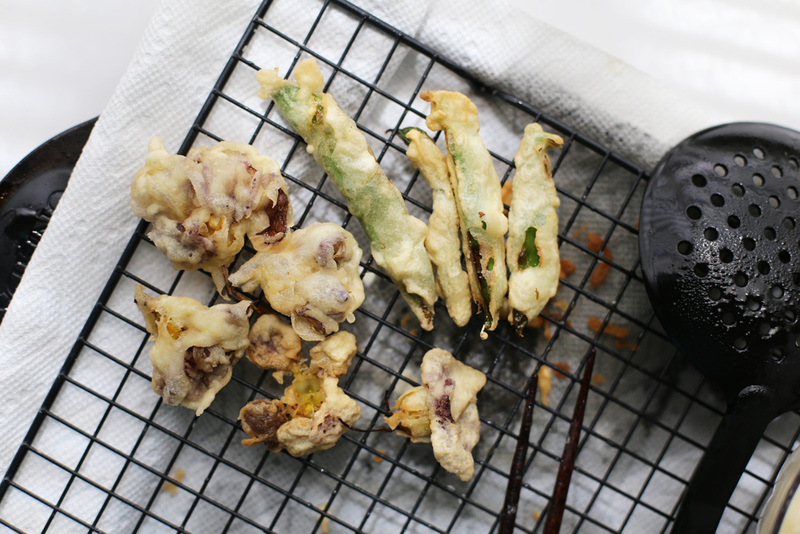 You can also make tempura, which makes for an even more delicious meal. This is the tempura recipe I used. Fun fact: I found out yesterday that tempura was introduce in Japan through Portuguese traders.